Most of the jobs we have actually seen drones perform are focused on surveillance — livestock monitoring, wildlife surveying, wildfire mapping, home security, and automated road patrols. 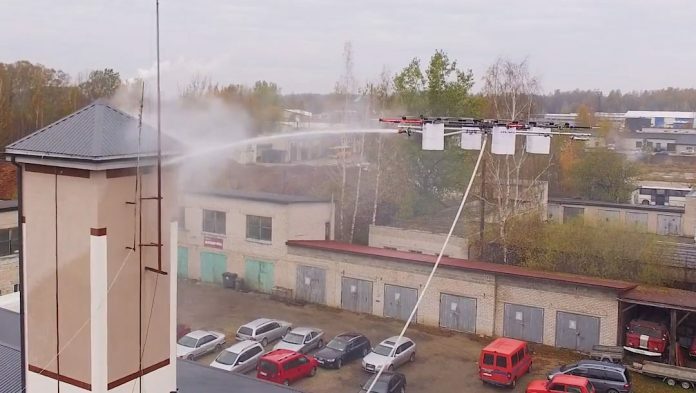 However, drones can also be used to carry out dangerous and dirty jobs that put humans at risk. Aerones, a Y Combinator-backed startup based in Latvia, is building giant heavy-lifting drones with 28 motors and 16 batteries, capable of lifting up to 400 lbs (180 kg). The possibility for such heavy payloads means that the drone is able perform a variety of tasks. One such task, currently carried out by humans and involving a certain amount of risk, is wind turbine maintenance. The drone can wash and de-ice a turbine’s blades using high-pressure hoses. Aerones believes its drone can revolutionize this process, lowering costs by improving efficiency, and eliminating the risk to humans. Depending on the size of turbine’s blades and the wind conditions, Aerones says its system could clean or de-ice 10 turbines (30 blades) in a single day. The cameras on the drone can be used to inspect the blades before and after a clean. Aerones says a pre-wash inspection flight “gives information on the kind of dirt on the blade, which allows you to estimate the cleaning time, let you see any damage, imperfection, crack or hole in the blade.” On the other hand, a post-wash flight can help reveal any damage that was not visible when the blade was dirty, and confirms the cleanliness of the blades. The Aerones is not just a large drone with a hose attached – there is a lot more to it. The company describes it as “rock steady” in strong winds, owing to its unique stabilization system. The drone includes safety features such as ultra-HD and thermal cameras to aid pilot control and pinpoint hotspots, built-in radar technology to avoid obstacles in low visibility situations like in smoke or fog, constant monitoring of battery and motor temperature, and fail safe measures like parachutes in case the drone malfunctions mid-air. In addition to wind turbine maintenance, the company is also working on other applications for its drones. These include firefighting, cleaning the outside of high-rises, and human rescue operations in places inaccessible via helicopters or ground vehicles. Aerones is continuing with efforts to attract funding while developing and testing its technology around the world. For now, they are not looking to sell the system as a package – they are offering drone services to customers instead. However, that approach could change in the future.